This month my exchange card was for Petra (pts). I decided to make a Criss Cross card, you can find a tutorial from Teresa's blog "Craftingallday Creations". The pattern is from Ann's Paper Art a672, I didn't use the complete pattern. Threads are Mettler Polysheen, 0824, 2905, 3045. The postcard stamp is by Joy! "Old Letter Butterfly" I coloured the postcard with Joy! chalks. Paper is by Maja Designs, from the Vintage Spring Basics set. Spellbinders S2-014 makes a lovely edge above the postcard. "For you" stamp is from Whimsy Stamps. For the swirls along the side I used Marianne Creatables LR0116. I used a Martha Stewart punch for the edging. I enjoyed creating this card and I would like to thank Teresa for making the tutorial easy to follow. Thank-you for coming by and having a look. Today I am going to show you the card that I created for my son and daughter for Easter. Threads are Mettler Polysheen 0352, 0630, 2250, 2550, 3650. The beautiful decoupage is available from the webshop. 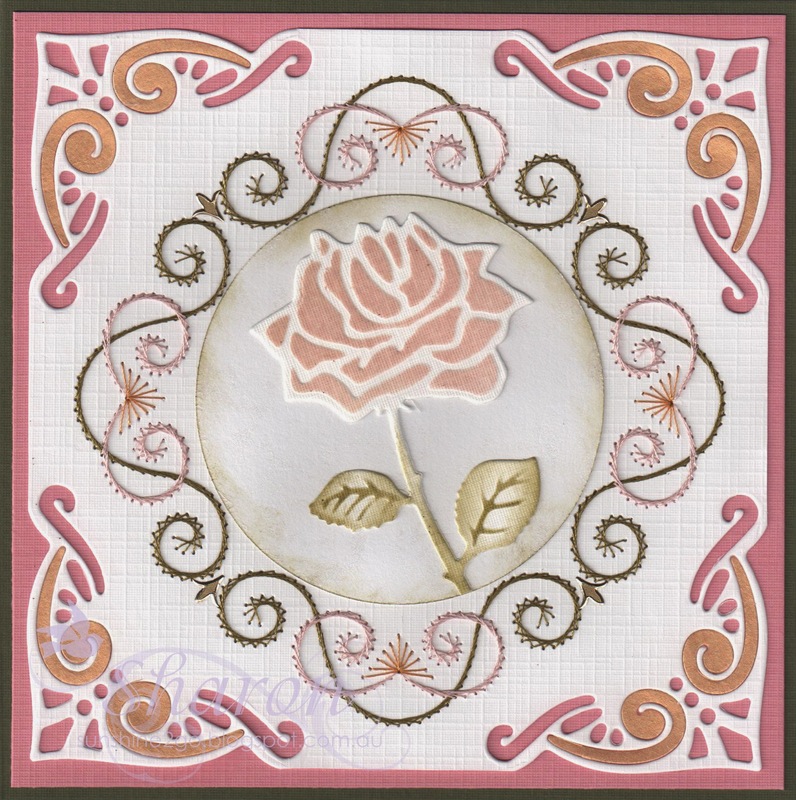 I added Distress Ink "tattered rose" to the corner flower die by Leanecreatief 45.8558. Distress Ink "wild honey"edges the Nellie Snellen mfd055 circle die. I enjoyed created this card and I hope that you also like it. I hope that the Easter Bunny leaves you all some yummy chocolate eggs. 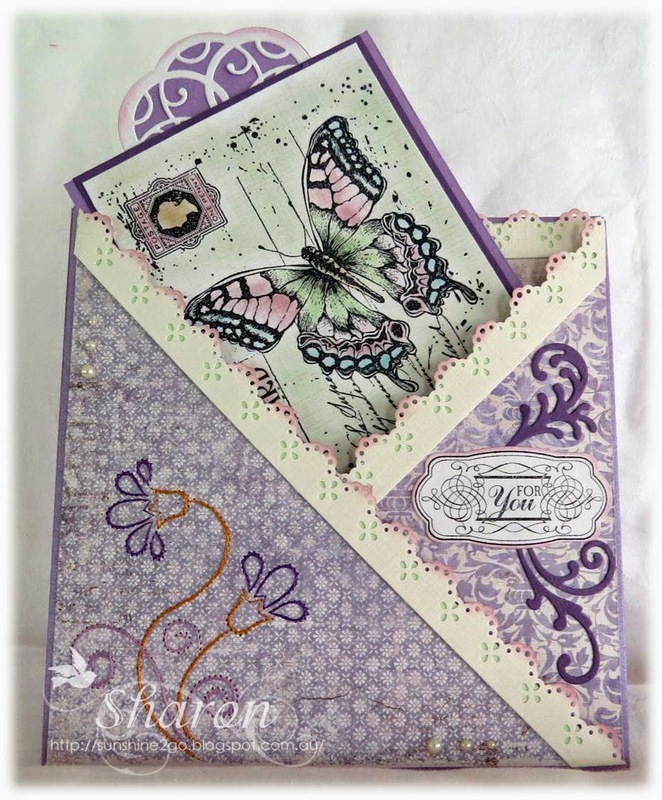 I created this card with the pattern that Ann gave to her forum members that participated in the forums 5th birthday celebration. 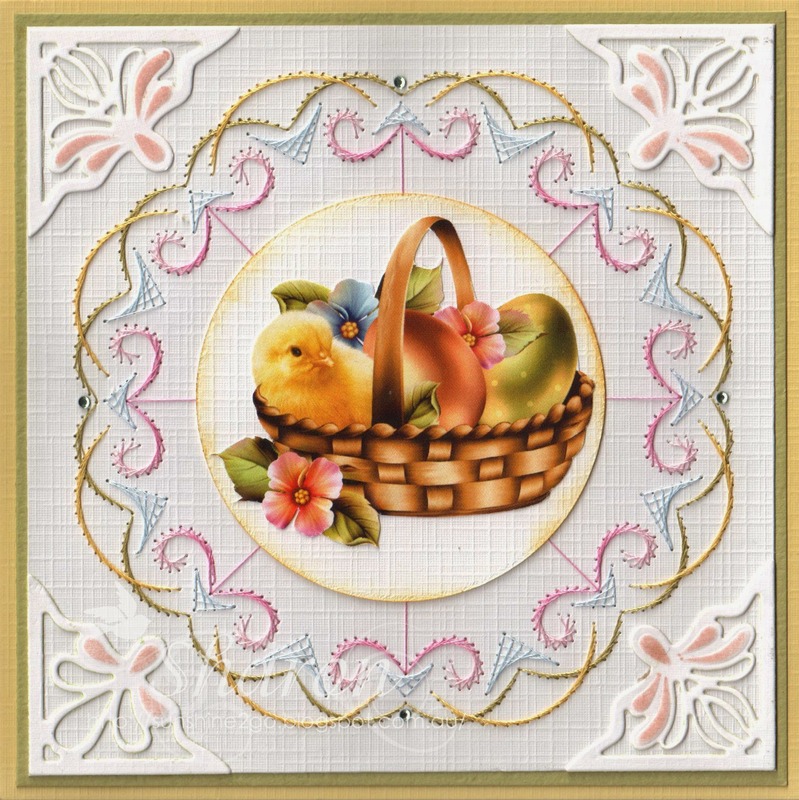 The pattern is a684 and is available from Ann's Paper Art webshop. Threads are Mettler Polysheen, 0821, 1755, 6133. Rose die is Marianne Design LRO294 and has been coloured with Distress inks, forest moss and tattered rose. Once again I have used a circle die by Nellie Snellen mfd055 which I also edged with forest moss. I sent this card to a very special friend by the name of Sue who lives in England. I enjoyed creating this card with the new pattern and I hope that you also like it. It is hard to believe that we are in April already, the year seems to be flying along far to fast.